These LG V30 mock-up renders looks completely overhauled​, as the slide-out secondary display could come in handy for multitasking purposes. LG V30 is the third flagship from the LG V-series smartphones and we’re hoping to see something quite different. According to the unofficial preliminary specifications for the LG V30, the upcoming flagship device will feature a whopping 6GB RAM and 128GB of internal storage coupled with 6.2 inches display and a dual front and back cameras. The flagship will be powered by Snapdragon 835 and we are to expect a makeover ticker notification. As usual, renders are beginning to surface online and a lot of these envisioned mockups reveals an LG V30 that features a slide-out secondary display. Comparing the Nokia 808 with the current device we’re using now, you’d agree with me that there isn’t much difference in design, except for the Galaxy S8 and LG V20 that brought cool rounded display corners. 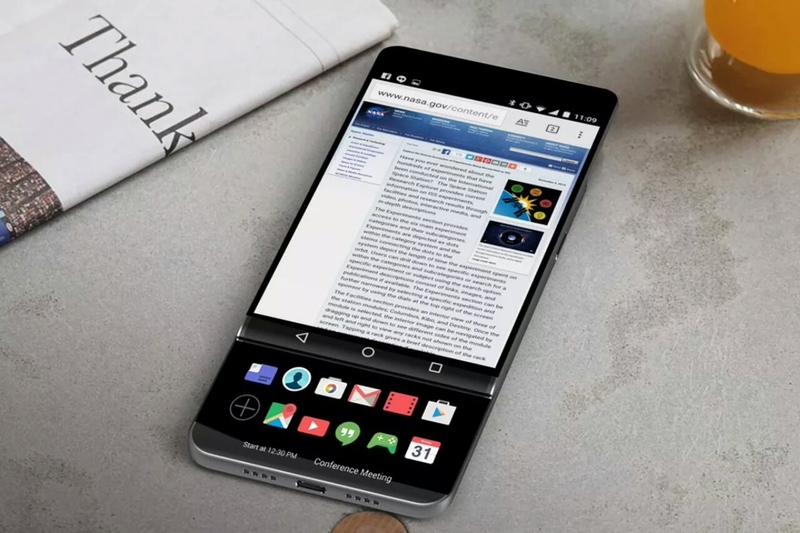 Now imagine a super slim LG V30 featuring a slide-out secondary display (not keyboard, but a fully-fledged display). The device will be quite unique and perhaps interesting (that’s if the renders are true). The notable leaker Evan Blass recently shared stunning render of the LG V30 on his twitter timeline, and a close look at this renders suggests an LG V30 with a slide-out secondary display. Below are his tweets and the mock-up renders for LG V30 as shared by Evan Blass. Seeing is believing i guess!. LG V30 is also known as Project Joan, Evan Blass went further to share the “LG V30” renders with its secondary display fully extended. Now looking at the renders above, you will notice that the slide-out secondary screen will be fully interactive, as it is been designed to easily call-out other apps while performing various tasks on the primary display. A usuage scenerio was shared also to explain how the slide-out secondary display works. The above LG V30 renders looks completely overhauled and they remind me of blackberry priv that was released back in 2015. The case is now different because the BlackBerry Priv featured a slide-out keyboard and LG V30 could feature a Slide-out display. So will you buy an LG V30 that brings the design as shown above?.